﻿ Reactimex S.A. de C.V.
OUR MISSION: We clearly understand the statement "satisfaction of market needs under internationally competitive conditions" as our complete dedication to bring to our clients, products and services of optimum quality, on a timely fashion at prices that compare favorably with those of our competitors. We will actively aim to identify and serve market niches for advanced intermediates and other fine chemical products whose manufacturing involves multi-step batch processes. Maintaining lower costs via the development and use of efficient process technologies, backward integrated to the extent needed to make it possible to start from basic and widely available raw materials. Offering higher value to our clients, by adapting the specifications and characteristics of our products to optimally respond to the client’s product performance needs. To make this possible, we will rely on our own research and development capabilities, and on our ability to locate, absorb and adapt outside chemical expertise, two capacities which we consider are essential for our long term growth and prosperity. Hire, train and retain bright, hard working, and responsible personnel. Design and maintain state of the art production facilities. 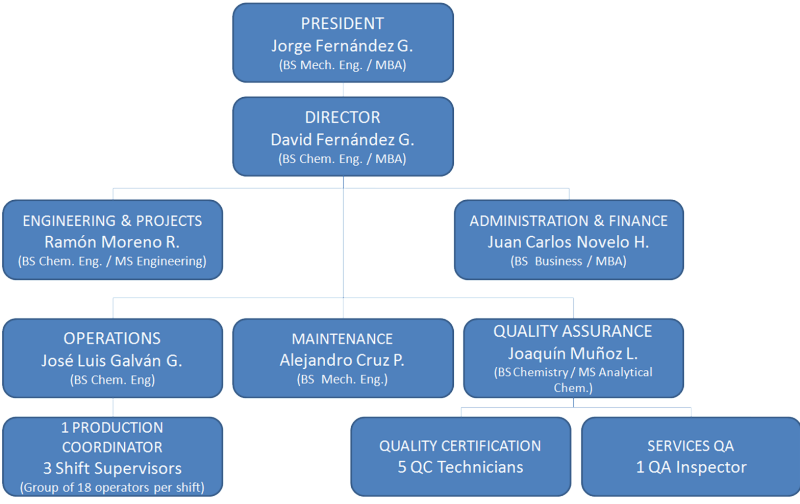 Run a strong quality assurance system. Observe all applicable health, safety, and environmental protection regulations. Our commitment to quality shall be reflected by our ability to deliver products and services of high quality as measured by our client’s standards, at competitive prices, while assuring a fair compensation to our employees and adequate economic returns to our shareholders. Outsourcing? Fine and Specialty Chemicals, Chemical Intermediates, R&D Services?